Norma and Roy are sister & brother in their twenties who live with their mother in London. It appears to be the early 1960s, although this is never explicitly stated. Roy has just started a new job as a delivery driver for a local laundry company. Norma is obsessed with looking her best & being a glamorous modern woman. Their mother, Mary, doesn't seem to like Norma very much, but is always glad to see Roy. For most of the first couple of hundred pages, Woman's World is dedicated to setting up its characters and the world they occupy. The plot doesn't really kick in until about halfway through the book, but the first part of the book is nonetheless ripe with mysteries: why does Mary distrust Norma? As the book begins, Roy has just returned from being away for a while - where had he been? What lies beneath Norma's superficial-seeming character? What is the significance of Norma's 'accident' in the past that gets mentioned a few times? 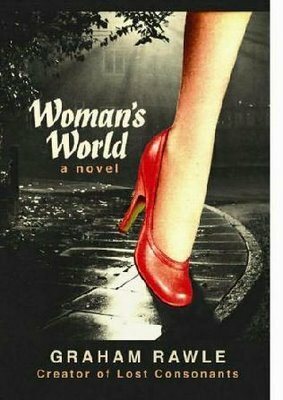 Woman's World has an intriguingly noir-ish setup. Rawls tempts the reader with these puzzles before bringing it all into sharper focus with the mid-book plot twists. I don't intend to say anything about those, in part because my reading of Woman's World was somewhat spoiled by having read an indiscreet review which gave away a major plot point without acknowledging that it was about to do so. What is worth mentioning, however, is the unique and fascinating way in which Woman's World was written: Rawls wrote the basic story in rough draft form, and then pieced all his words together by cutting up old women's magazines. Every single word, punctuation mark, page or chapter number comes from an actual women's magazine - articles, stories, advertisements: according to the author's postscript it took five years to assemble. While this is an interesting gimmick, it's not only a gimmick: since Norma narrates the story (even the bits at which Roy but not she is present), we begin to understand her addiction to these magazines and devotion to presenting herself as the sort of woman 1960s magazines idealised. For the reader, it is often a subtle commentary on these standards, as Norma's narration occasionally veers off into endorsements of cleaning products or clothing styles. It also acts to underline the contrived nature of Norma's character as she tries to present it to the reader. As the book progresses, we get a better idea of why she might use such a method to tell her story. As I said, I'm not going to reveal too much more of the plot or revelations throughout Woman's World. Yet I give it a strong endorsement, since it manages to succeed on two levels: on a mechanical level, it's an intriguing way of writing a book, and yet the story & characters are interesting enough that the form serves in conjunction with the content, rather than distracting from it or covering up a shortage of actual ideas. Woman's World is well worth your time and should attract an admiring audience.